, these images are no longer available in Street View. Pay extra attention during pre-dawn and dusk hours. Slow down. If a deer runs in front of your vehicle, driving at or below the speed limit reduces the likelihood of serious injury to yourself and your passengers. Buckle up. Your odds of walking away from a collision with a deer improve dramatically if you and all your passengers are wearing seat belts. Use your high beams (when no oncoming cars are present) and watch for the reflection of deer eyes and silhouettes on the shoulders of roads. Don't swerve. Few drivers die or are seriously injured in direct collisions with deer. The greater risk is from veering into oncoming traffic, a tree, or off the road. Brake until the last fraction of a second before impact, then let off your brakes. This will cause the front of your car to rise, increasing the odds that the struck deer will pass underneath your car, rather than be lifted into your windshield. If you do strike a deer, do not try to touch it or move it yourself. Despite your kind intentions, an injured deer might panic and harm you. Contact police or other authorities for assistance. We're sad that this accident occurred and we consider ourselves fortunate that our driver was not injured. Growing up in Vancouver during its mushrooming period, which began in the mid-'80s, I witnessed a small city's downtown core give way to a cosmopolitan urban center (or "centre," as we write) of glass towers. Approaching the peninsular downtown, encased by rugged mountains and the Pacific, any local still feels awe at its newfound density and how much it's grown. 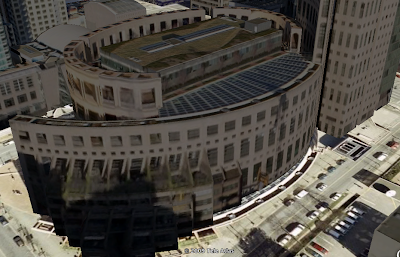 Yesterday, more than 1400 buildings in Vancouver became visible in Google Earth's "3D Buildings" layer. With the 2010 Winter Olympics just a year away, I'm especially excited that you can now get a richer sense of Vancouver's distinctive splendor, which marries advanced urban development with a dramatic coastal landscape. You can see places like Moishe Safdie's colosseum-like Library Square, the waterfront Canada Place (with its "Five Sails"), and Olympic venues such as the domed B.C. Place stadium. To those seeing Vancouver for the first time, I hope you'll realize it's a city worth visiting (I'd suggest in the summer, when it rains less). To the other Vancouverites, I hope this rich, rain-free view of your home makes you appreciate it even more. , an application written by engineer David Oster that allows you to "surf" any region on the Earth's surface using a Nintendo Wii Balance Board and the Google Earth API. As promised, I wanted to let you know that the EarthSurfer open source code is now available for download. 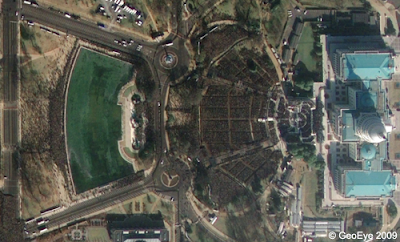 We are always excited to see clever ways to interact with Google Earth. The DFKI research lab in Germany developed a similar way to interact with Google Earth using a Wii Balance Board while others have experimented with a steering board, Wiimote, floor pads, a multi-touch monitor, and a vector pad. Check them out! We recently previewed EarthSurfer, an application written by engineer David Oster that allows you to "surf" any region on the Earth's surface using a Nintendo Wii Balance Board and the Google Earth API. As promised, I wanted to let you know that the EarthSurfer open source code is now available for download. CNN.com has pulled together a great map using the Google Maps API for Flash which is currently mapping iReports ("personal accounts and stories from the inauguration in Washington"). Click red "CNN" branded map markers to reveal CNN photos and videos from the Inaugural weekend and throughout the day. CNN has also made use of Google Maps to chronicle Obama and Biden's Whistle Stop Tour from Philadelphia to DC. Oprah's producers and journalist Lisa Ling are in D.C. to meet people and visit the inauguration hotspots. They have made use of Google Maps to plot their adventures and map streaming videos from their interviews with the big celebs and ordinary folks alike. Click "Start watching exclusive, around-the-clock videos from Washington, D.C.!" to launch the Google Maps view. The Inauguration Day version of WashingtonPost.com's innovative news mapping platform will geocode real-time photos, video and blog posts. The Washington Post's Steven King explains that this involves "more than 30 photographers and videographers in the field using Sprint modems with the ATP Photo logging devices to transmit geocoded images and video back to the downtown newsroom where a team of photo editors will be selecting the best images from each location and publishing them in as close to real-time as possible. A team of 40+ reporters will be deployed through out the city providing information that will be compiled and delivered into TimeSpace with location specific information." The Wall Street Journal's Google Map showcases a full inaugural guide to events and other things to explore in the District. Check out "Jan. 20" and "Parade Route" for details on the parade, and other events taking place following the ceremonies. More photos and content can be found below the map view. Earlier today, we posted some tips about how to use Google Maps to be prepared for tomorrow's Inauguration. Well, for those who aren't able to take in the historic event in person, our own 3D data specialist Nathan Kohrmann put together an amazing model of the Inauguration venue -- the US Capitol Building. Visit the Google 3D Warehouse where a full scale replica of the 2009 Inaugural Stage is ready to be explored... complete with Barack Obama taking the oath! With Google Earth installed, click "Download Model" to instantly import the stage into a fantastic 3D view, then let the fun begin. Zoom in close to where Barack Obama is standing on the stage to take in the exact view he has or swoop down to the National Mall to see what millions of other spectators are watching. News.com.au has also put together a great Street View "walking tour" of the Inaugural Parade route, which is another great way to feel like you're a part of the festivities no matter where you are. 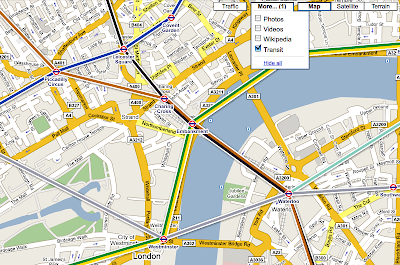 Google Maps can also be used to plot walking directions, and if you're going to be using public transit, check out Metro's interactive map or this mapplet. You can use Street View to preview the areas to get a better idea of where you're heading. Street View can be especially useful for finding very specific meeting points for you and your friends, since most areas will be flooded with people -- browse the area to find the exact spot to fnd each other, like "next to the fire hydrant at the southeast corner of 7th and E Street". The Wall Street Journal has a helpful map for Inaugural events taking place day by day, as well as must-see D.C. attractions to take in. You can find some more helpful (and fun) maps here, and I'll be back tomorrow with another roundup of sites that will help you prepare for the parade and also take in the historic event over the web and of course... on a map! There is most definitely a buzz in the air. Hundreds of thousands of people are streaming into Washington D.C. to see Barack Obama sworn in as America's 44th President. If you're lucky enough to be in D.C., you'll need some help to get your bearings and map out your inaugural adventures. Google Maps can help, every step of the way. Earlier this week, we told you about the new Help Forum for Google Maps. Well the Google Maps enthusiasts aren't the only ones who will benefit from the new and improved help system: we're also unveiling the Google Earth Help Forum! Just like the Google Maps help forum, our new forum should make it easier for you to find answers, share resources with others, and have your participation acknowledged. You can read more about the changes in Wednesday's announcement, or simply head over to the new and improved Help Forum to see for yourself. We really appreciate all the great discussions in our old Group, and we encourage you to check out the new Google Earth Help Forum! alongside a brand-new Google Earth layer highlighting the historic city in breathtaking detail. Whether you're putting the finishing touches on your submission or have yet to explore the new layer, you still have some time! Just be sure to register and upload your files no later than Monday, February 9th. Back in November we launched the Ancient Rome in 3D Curriculum Competition alongside a brand-new Google Earth layer highlighting the historic city in breathtaking detail. The Prado Museum has become the first art gallery in the world to provide access to and navigation of its collection in Google Earth. Using Google Earth, art historians, students and tourists everywhere can zoom in on and explore the finer details of the artist's brushwork that can be easily missed at first glance. The Google Earth Prado layer also includes 3D models which allow you to fly around the Prado buildings to experience the museum as if you were actually there. To view the layer, select 3D buildings from the left panel and type 'Prado' in the 'fly to' search box. You will then be transported to the Prado Museum in 3D where you can click on an icon to view the masterpieces. demo, which is an open source program on a webpage. I wrapped it as a Macintosh application program so I could add Objective-C. Objective-C uses the Macintosh Bluetooth support to decode the Bluetooth packets from the Wii Balance Board. The Balance Board support is my work. I based that on DarwiinRemote, open source decoders for the Wii Remote. Earth Surfer and its source code will be available next week on the Google Mac Developer Playground. While it's fun to use Earth Surfer, I really wrote it to inspire others to write their own programs. It's all open source using the Apache License, so you can use the code in your own programs, even commercial ones. As part of the Lat Long blog team, I'm naturally a big fan of both maps and blogs. Recently, the Blogger team launched a feature that combines both of these -- geotagging for your blog posts. When you use Blogger in draft, you'll see an option below the post editor to "add location". If you know the exact location, you can simply enter the address, city, or zip code; if you're blogging about the view from the top of a mountain you just hiked or don't have a precise location, you can browse the map or turn on satellite mode and put a marker at the right spot (and the reverse geocoder will label the location for you). The geotag will appear below your published post as a link, which will open up Google Maps. The location will also be included in your blog's RSS and Atom feeds using GeoRSS. Read more about geotagging on the Blogger in draft blog.